My dad could fix just about anything with duct tape. Your prom dress needs hemming. Duct tape will solve that. Muffler falling off. Duct tape to the rescue. Textbook falling apart. Duct tape again. If it wasn't duct tape, it was clothes hangers or paper clips or old shoe laces. He was good with his hands and it made him happy to fix things using just the supplies he had to hand. Dad was also an optimist. He believed nearly everything could be fixed if you just put a little time and effort into it. So his garage and basement were full of all the broken things he intended to fix someday and the tools and odds and ends he intended to use to fix them. During one of my visits near the end, the dryer stopped working. Dad had some suggestions for repair but eventually I solved the problem on my own. The problem was excess lint clogging up the exhaust system. I gathered all the wire coat hangers I could find, bent them out into a line and duct taped them together. I then went outside and used my improvised snake to clean years of accumulated lint from the pipe. Like my dad I can use duct tape to give a bit more life to items that are on their last legs. But it doesn't last forever. 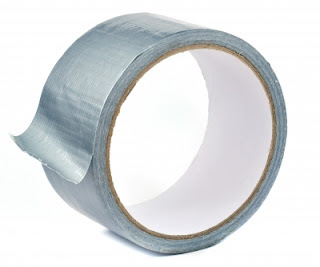 Duct tape doesn't fix cancer. Duct tape doesn't hold life in a body when it is time to go. But every time I pull out a roll of duct tape to fix something or solve a problem, I'll think of my dad. Duct Tape - it's our secret weapon around here too. Michael's love of duct tape is a family joke. I love getting to know your father through your shared thoughts, Mary.